After rather a barren summer, there's quite a glut of films which I'm interested in seeing at the moment. I caught two of them this week (The Guard and The Skin I Live In), but there's still the Inbetweeners Movie, Kill List and Drive to see in the near future, so things are looking up. I'm not generally a huge fan of James Cameron, but he has made two or three films which I think are great: this one, Terminator and T2. I suppose I've got a bit of a soft spot forTrue Lies too, but I certainly wouldn't call it a 'great' movie. Anyway, I think Cameron is certainly to be applauded for the way in which he took the sequel to the original movie in a completely different direction. Many horror sequels (well, many sequels in general) take the easy way out and just attempt to carry out a complete retread of the original movie, but in the case of Aliens, the story is taken on in a way and expanded in a satisfying way which makes sense in terms of the Alien universe. In this movie, rather than have a single Alien let loose on board a spaceship, a whole host of Aliens have overrun the human colony which was established on the far flung outpost where the original Alien eggs were found. By the time Ellen Ripley (Sigourney Weaver) and a team of gung ho marines have arrived, the human colonists have been almost completely wiped out, used as hosts for a nest full of Aliens. 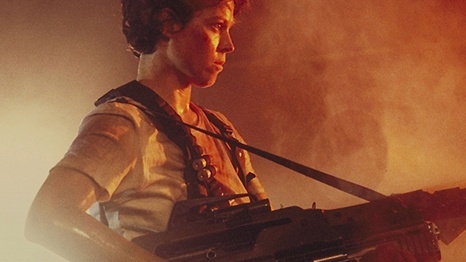 Ripley has to use her knowledge of the Alien from the first movie to assist the marines, who have no idea of the terrible foe which they will have to battle. One of the interesting things about this film is that it shows how the Alien society works - in many ways, its rather like a bee hive or ant's nest operates, with a queen at the top, laying eggs and an army of worker drones carrying out their duties as part of a hive mind. The movie is also a great success in moving the focus away from horror (though there are still a few scary moments), into a terrific action picture, as the marines work to wipe the Aliens off the planet. Ripley uses her knowledge of the Alien from the first movie to great effect. A brilliant follow up to the original classic. Unfortunately, the second follow up to Alien was not nearly as good. This was David Fincher's first feature, but he can't really be blamed too much for the movie's failings as he was brought in an attempt to save the troubled production which had already been through a number of different directors and scripts before he took over. In the end, a compromise was made in relation to the script, combining two ideas - that of an Alien set loose in a prison planet, and that of an Alien running amok amongst a remote space monastery. This was actually the first Alien film which I saw, and I remember enjoying it very much when I was 16. However, having subsequently seen the first two movies, Alien 3 can only suffer by comparison. 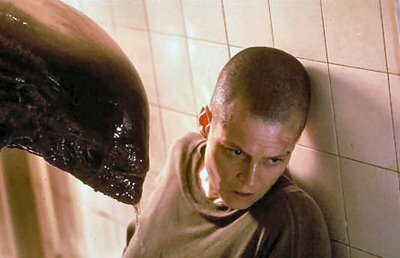 Alien 3 has its moments, including some very strikingly directed scenes, but on the whole it is hamstrung by a rather confusing plot and a number of supporting characters who look very similar and are entirely indistinguishable from one another - to the extent where there is very little emotional impact when they are picked off by the Alien. It also kills off one of the few interesting characters too early on (Clemens, a doctor played by Charles Dance who enters into a relationship with Ripley). Pedro Almodovar's latest effort tells the story of a brilliant but highly disturbed plastic surgeon, played by Antonio Banderas, who is keeping a beautiful woman (Elena Anaya) prisoner/ patient captive in his large country estate. This is a film which is very difficult to review - discussing the details of how Anaya came to be a captive guinea pig for Banderas would necessarily mean giving away specifics of the plot, which is both twisted and full of twists. On the other hand, it is preferable to see this film whilst knowing as little as possible about the plot, so I don't want to be guilty of spoiling it for anybody. What can I say about this movie then? Well, it's beautifully shot and directed, with both Banderas and Anaya providing strong turns. On the other hand, what transpires during the course of the film does rather stretch credulity, though as the story is so well told, it's really only when you emerge from the cinema that you start to wonder whether the events you have just witnessed are at all possible. A good film, but not one of Almodovar's very best (my personal favourites being Talk To Her, Live Flesh and Bad Education).